He has been called a race pimp, a racist, a charlatan and a money grubber. Sad for the people following him all the appellations are deserved. His persona when he used to wear his too tight or overstuffed running suits reminded us of Boss Hogg. Now he has shed pounds like a stripper sheds lingerie and he looks like a burlesque of his former self. 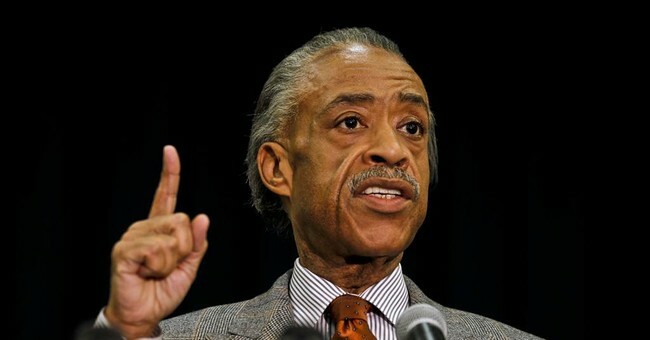 It is said he lied about Tawana Brawley. It is said he lied about Yankel Rosenbaum and the connective Crown Heights tragedy and now in these times and in between Crown Heights and today, he has set out to work his alchemy in the most vile way. See the beginning of the new story by Katy Pavlich below, then follow the story to its conclusion. It’s becoming clearer every year that the only thing keeping Al Sharpton relevant is Al Sharpton making up bogus claims of racism. Despite George Zimmerman being acquitted on murder and manslaughter charges by a jury of his peers and despite zero evidence in his trial showing racial bias, Sharpton is planning protests in 100 cities this weekend. The Rev. Al Sharpton is calling for a “Justice for Trayvon National Day of Action” on Saturday and say demonstrations are planned in more than 100 cities nationwide. Saying there would not have been a trial in Florida without pressure from activists, Sharpton was confident that continued pressure would result in a federal civil rights case. National Action Network is organizing the protests at federal court buildings to press the Justice Department to bring a civil rights case against George Zimmerman, who was found not guilty in the death of teenager Trayvon Martin by a Florida jury on Saturday. Sharpton said his National Action Network intends to keep the pressure on until a civil rights case is brought, insisting the protests will show the national anger over the verdict is not a “two- or three-day” thing. What do Steven Pagones, Kareem Brunner and George Zimmerman have in common?